* NOTE: Inside delivery price is for ground floor and / or approved elevator access only. High curbs, steps, narrow hallways, restricted access areas, etc. may result in additional charges. Deliveries must be made during normal daytime working hours. All lateral models available in durable textured black, putty and light grey finishes. 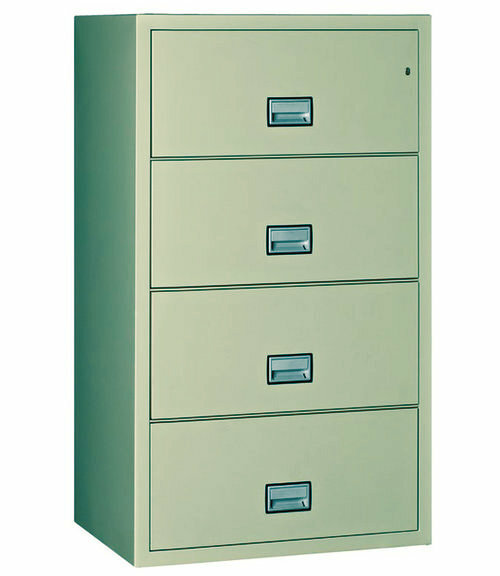 Independent drawer insulation protects closed drawers if one is left open during a fire. Class 350 — 1-hour fire-resistant. MTC Grade B rating protects CDs, DVDs, USBs and memory sticks. Resists explosions of up to 2000°F.